Pro Sim racers can now enjoy the quality of the Thrustmaster TMX wheel plus the highly-awarded three-pedal Thrustmaster T3PA pedal set as an added bonus in the Thrustmaster TMX Pro bundle! It’s a deal that racing dreams are made of! A complete racing simulation solution at an exceptional price! The Thrustmaster TMX 900° force feedback wheel for Xbox One and PC is very realistic wheel with a 11”/28 cm diameter. Thanks to the embedded software the TMX is automatically recognised by Xbox One. PC compatibility (Windows 10/8/7/Vista) is guaranteed thanks to the Thrustmaster drivers, which can be downloaded at the Thrustmaster website. The drive system with adjustable force feedback lets you feel every detail while you’re racing (the road or track’s relief, loss of tire grip, braking, bumps and impacts, etc.) and the rotation angle is adjustable from 270° to 900°! To top it off, the Thrustmaster TMX has mixed belt-pulley and gears system (smoother, more fluid and less noisy than helical gears) with metal ball-bearing axle (for enhanced sturdiness). Combine the Thrustmaster TMX Pro wheel and pedal set with a Playseat® racing chair for the most fun and realistic racing experience possible! 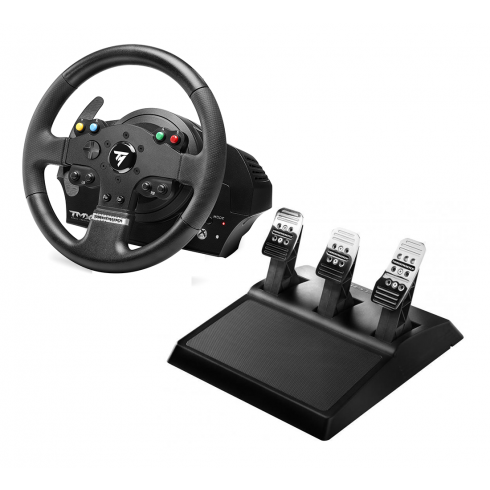 Compatible with the Thrustmaster TH8A shifter, comes with 2 included shift-plates: "H"-pattern (7+1) and Sequential (+/-).